Sports Desk: Sir Roger Bannister, the British athlete who became the first man to break the four-minute mile, has died in Oxford at the age of 88, his family has announced. A statement released on behalf of his family said: "Sir Roger Bannister, died peacefully in Oxford on 3 March 2018, aged 88, surrounded by his family who were as loved by him, as he was loved by them. On 6 May, 1954, he became the first athlete to run a mile in under four minutes, clocking a time of three minutes and 59.4 seconds at Iffley Road sports ground in Oxford. "It's amazing that more people have climbed Mount Everest than have broken the four-minute mile," he told The Associated Press in 2012. A few months later, Sir Roger beat his Australian rival, John Landy, in the "Miracle Mile" or "Mile of the Century" at the Empire Games in Vancouver, British Columbia, as both men ran under four minutes. Sir Roger retired from competitive running to pursue a long and distinguished medical career as a neurologist. As chairman of the Sports Council between 1971 and 1974, he developed the first test for anabolic steroids. In 2011, he was diagnosed with Parkinson's disease. Prime Minister Theresa May remembered Sir Roger as a "British sporting icon whose achievements were an inspiration to us all. He will be greatly missed." Lord Coe, president of the IAAF, also paid tribute. "On the 6 May 1954, Roger made the impossible possible," he said at an IAAF event. "The world's best runners had been attempting the four-minute barrier for a quarter of a century. It was as much of a psychological barrier as it was a physical barrier. Bannister's assault allowed mankind to enter a world filled with new possibilities. 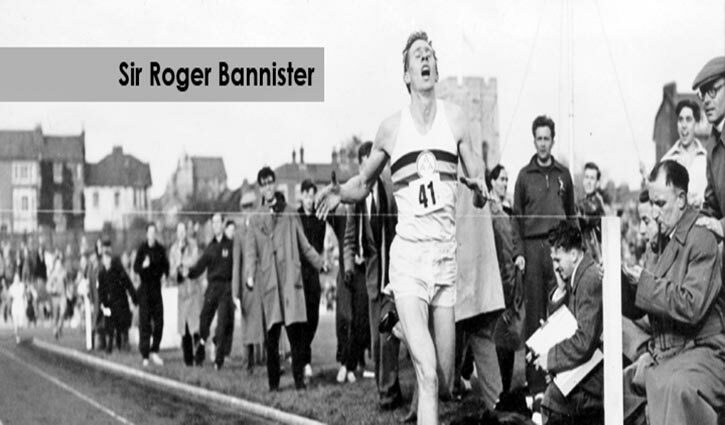 Steve Cram, another British mile world record breaker, said on BBC Radio 5 Live: "To have Roger Bannister as a Brit having done that was something I used so often over the years to inspire me individually. I wanted to be a great British miler following in his footsteps." Lord Patten of Barnes, the Chancellor of Oxford University, said: "He was not just one of the great athletes of the last century but a superb doctor and servant of Oxford University. Professor Louise Richardson, the Vice-Chancellor, said: “Roger Bannister epitomised what it means to be a living legend.